WizKids will release the Marvel HeroClix: Captain Marvel Movie Gravity Feed in February. 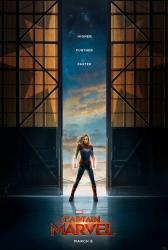 This Gravity Feed will feature characters from Marvel�s Captain Marvel movie which releases in theaters on March 8 (see �First 'Captain Marvel' Trailer�). The 24-count gravity feed will include 12 different figures including Carol Danvers, Nick Fury, and Phil Coulson, along with various Kree and Skrulls. The set includes 9 Common Figures, 11 Rare Figures, and 2 Chase Figures.